Come see this 2010 GMC Terrain SLT-2. Its Automatic transmission and Gas V6 3.0/183.1 engine will keep you going. 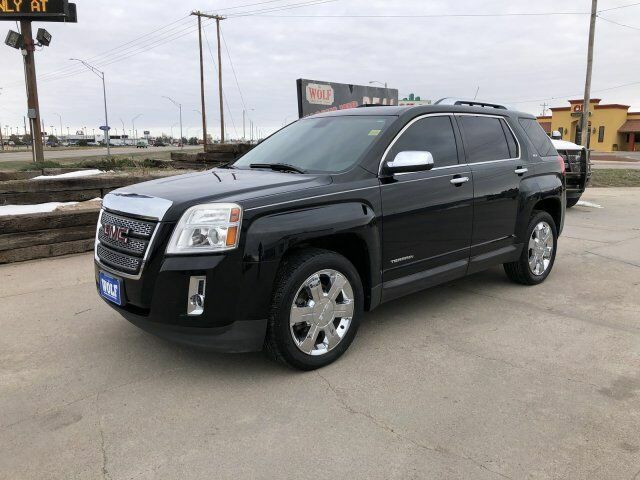 This GMC Terrain features the following options: WHEELS, 4 - 19" X 7.5" (48.3 CM X 19.1 CM) CHROME CLAD ALUMINUM, TRANSMISSION, 6-SPEED AUTOMATIC (STD), TRAILERING EQUIPMENT includes Class II 1-1/4" receiver hitch and 4-wire connection. (Maximum trailer weight of 1500 lbs. (680 kg) with (LAF) 2.4L I-4 SIDI engine and maximum trailer weight of 3500 lbs (1588 kg) with (LFI) 3.0L DOHC V6 SIDI engine. ), TIRES, P235/55R19 ALL-SEASON, BLACKWALL, SLT-2 PREFERRED EQUIPMENT GROUP Includes Standard Equipment, SEATS, FRONT BUCKET (STD), REAR AXLE, 3.39 FINAL DRIVE RATIO (Included and only available with (LF1) 3.0L V6 SIDI engine, (R3P) 4 - 19" x 7.5" (48.3 cm x 19.1 cm) chrome clad aluminum wheels and (MXO) 6-speed automatic all-wheel drive transmission. ), ONYX BLACK, LIGHT TITANIUM, PERFORATED LEATHER, and EXHAUST, DUAL WITH PREMIUM TIPS.